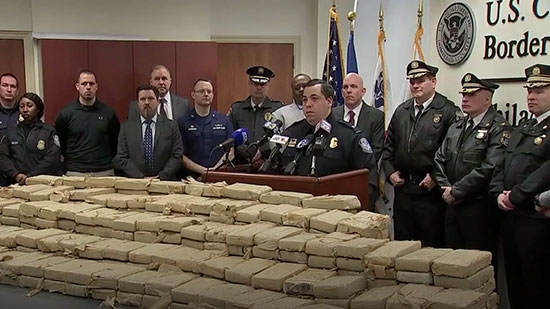 U.S. Customs & Border Protection officials confirmed at a press conference on Thursday, 3/21, that federal agents seized 1,185 pounds of cocaine from a shipping container at the Port of Philadelphia on Tuesday, 3/19. It was the largest cocaine seizure at the port in 21 years. Joseph V. Martella, Customs and Border Protection Area Port Director of Philadelphia, said that multiple agencies were involved including Delaware State Police, Pennsylvania State Police, Philadelphia police and the U.S. Coast Guard. Narcotics dogs alerted CPB officers to the container. They found 13 duffel bags containing 450 bricks of cocaine worth approximately $38 million. The container itself was filled with liquid rubber w/ the bags placed on top. The container started in Guatemala and made stops in Panama, the Bahamas, and finally in Philadelphia. It was headed to the Netherlands. The investigation has started to determine when and where the drugs were added to the container and where they were headed. 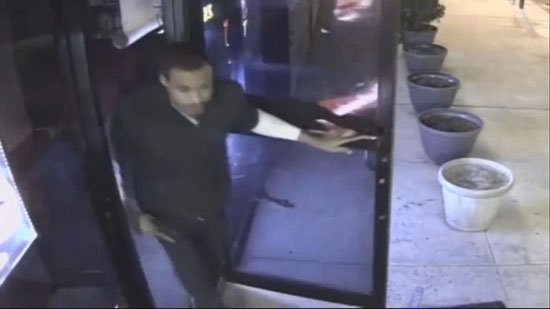 Philadelphia Police are looking to identify a man wanted in connection with the shooting death of a bar employee early Thursday morning, 3/21. It happened at closing time around 2 a.m. at the DelMar Lounge on the 200 Block of Chelten Ave. in Germantown. "The other customers cleared out around 2 o'clock (in the morning) and one male remaining customer then pulled the gun and announced a robbery," said Philadelphia Police Chief Inspector Scott Small. 58-year-old Jeffrey Johnson, a bar back, was shot once in the chest and robbed of "a couple hundred dollars." Johnson was taken to Einstein Hospital and was pronounced dead around 2:30 a.m. Surveillance video at the bar caught images of the suspect. He is described as a light-skinned black or Hispanic man in his 20s, 5' 8" to 5' 10", with a thin to medium build. He had a distinctive long goatee. He was wearing a dark t-shirt with a light colored long-sleeved shirt underneath. He was also wearing dark pants and sneakers. The man had been a patron at the bar last night and waited until closing time to strike. There is a $20,000 reward for information that leads to the arrest and conviction of the person responsible for this murder. Temple University will be offering walk-in vaccination clinics in response to the mumps outbreak on campus. The clinics will be held in Temple's Mitten Hall's Great Court Wednesday, March 27, and Friday, March 29, from 9 a.m. - 4 p.m. No appointment is necessary and the MMR vaccines are free, but you must have your OWLcard. As of Wednesday, there have been 74 confirmed or probable cases of the disease among students. There has been a petition to have school closed until the outbreak can be contained. Over 10,000 have signed.